EVER WISH YOU COULD GET BACK ALL THOSE HOURS YOU'VE SPENT FUTILELY HUNTING FOR LOST PACIFIERS? STOP SUFFERING FROM DREADED LOST-PACIFIER SYNDROME! WE CAN HELP! OUR PACIFIER CHAINS KEEP YOUR BABY'S PACIFIER WITHIN EASY REACH. 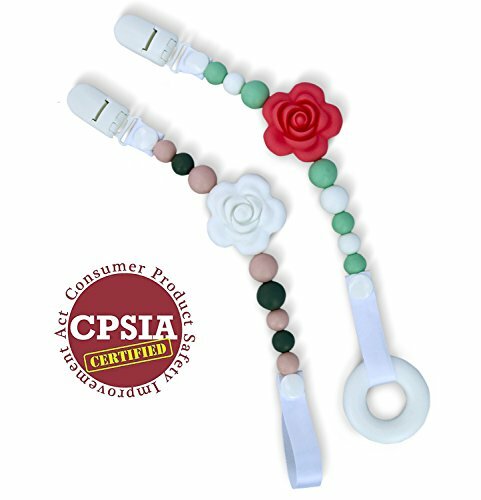 Food-grade silicone: Our set of 2 silicone bead teether-pacifier chains is made using 100% FDA-approved food-grade silicone beads and contain no BPAs, phthalates, PVC, cadmium, lead, or other toxins known to be harmful to your baby. Hand-crafted: Every set of pacifier chains is hand-crafted with care and shipped in a reclosable PVC pouch. This custom set includes our lightweight "Sedona Sunset" and "Tuscan Garden" chains. Smart design: Both chains are designed so that most of the weight of the chain is on the clip end. We found that, by placing more weight on the clip end of the chain, it's less likely that the weight of the chain will pull the pacifier out of your baby's mouth. 2" leash attaches to most pacifiers: As long as your baby's pacifier has at least one hole, you can attach it to our chains. We are small sellers. Please take the time to look at the detailed photos in our product manual showing you how to attach the leash to a pacifier before leaving us poor product reviews complaining that you are unable to attach a pacifier or that the leash broke because you tried to force the snap through a hole much smaller than the snap diameter. Any leash snap shoved through a small pacifier hole will eventually break. Convenient PVC pouch: Because wouldn't you rather put your baby's saliva-drenched pacifier chain in a plastic pouch than in a cotton drawstring bag? Yeah, we thought so. Bonus donut teething ring: For a limited time, a bonus white teething ring is included with our pacifier chain set. TIRED OF LOSING PACIFIERS OR PICKING THEM UP OFF DIRTY FLOORS? ★ Stop suffering from dreaded Lost-Pacifier Syndrome! We can help! Our 10" silicone bead chains attach pacifiers to your baby's clothing, blanket, stroller, or car seat. Never again hunt for lost pacifiers or worry about bacteria transferred from the floor or ground to your child's mouth. Please read our product manual for instructions and safety tips and NEVER LEAVE YOUR CHILD UNATTENDED WITH A PACIFIER CHAIN! SAFE AND EASY TO CLEAN ★ This chain set includes our pink/gray "Sedona Sunrise" and rose/mint "Tuscan Garden" designs. Our metal-free chains are certified to comply with the US Consumer Product Safety Improvement Act (CPSC/CPSIA). Each chain is hand-crafted using eco-friendly FDA-approved 100% food-grade silicone, free of BPAs, PVCs, phthalates, lead, and other toxins known to be harmful to your baby. Wash in gentle dish detergent and air dry, or pop in your dishwasher. PROMOTES DEVELOPMENT & PROVIDES RELIEF FROM TEETHING PAIN ★ Our chains stimulate sensory, visual & fine motor skills while providing relief from teething pain. For additional relief, freeze the chains when not in use. To accommodate a range of mouth sizes and bite angles, we included 3 different bead shapes. We also placed more weight near the clip end, so that a pacifier attached to one of our chains is less likely to be pulled out of your baby's mouth by the weight of the chain. UNIVERSAL LEASH ATTACHES TO MOST PACIFIERS ★ Our 2" leash attaches to Soothie, MAM, and Nuk brand pacifiers. Full-color manual with photographic instructions is emailed when your order is placed. If you've opted out of unsolicited emails, please message us on Amazon. HINT: If you're jamming the snap of the leash through a tiny pacifier hole, you're doing it wrong. The snap will eventually break. Way better to take 60 seconds and look at the photos in the manual. RISK-FREE 100% MONEY-BACK GUARANTEE ★ We're small US sellers and stand behind the integrity of our pacifier chains. If you're not completely satisfied with our product, return the chains at no cost to receive a full refund. Just choose "Item defective or doesn't work" as the reason for returning. Why buy from male-owned companies that dominate this category on Amazon? We are one of a handful of 100% woman-owned and operated US companies selling pacifier clips on Amazon. If you have any questions about this product by Blue Moon Innovations, contact us by completing and submitting the form below. If you are looking for a specif part number, please include it with your message.